I believe Mellben isn't a name that is unfamiliar to many Singaporean friends. It is soooooo popular that I never tried it before because the queue is forever long. Finally I had a chance to try out the ever popular crab-ster place, thanks to Silver & Fenny. My first attempt holding a crab & look ! 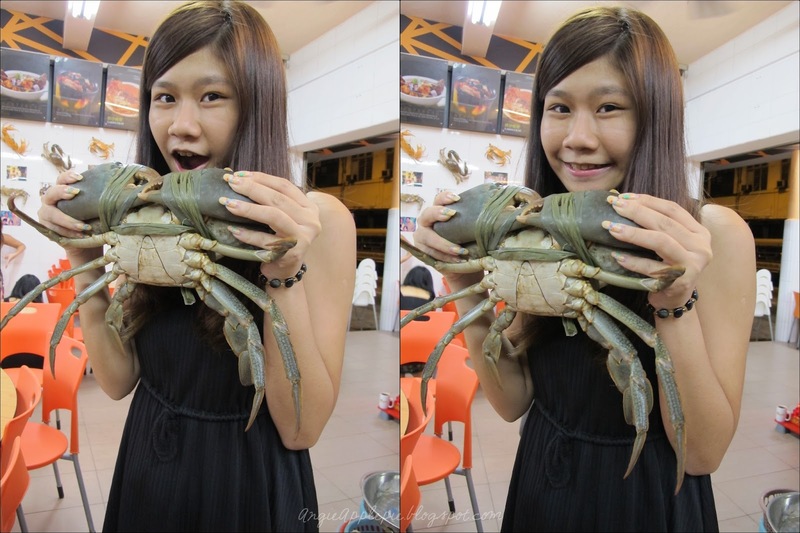 Even my face is smaller than the crab ! We had a total of seven dishes, including 3 crab dishes. To start off, we had the savory signature tofu. Topped with the spring onions and fried onion bits (?) , the fried tofu is smooth in the inside and accompanied with a nice thick gravy. The gravy, I likey. Followed up by the Lemon prawns, which was more like a tomyum prawn soup to me. Well, it just taste like tomyum goong and surely appetizing. We had an appetizer, a soup and a vegetable dish, of course we had something for the carnivores too. Meat lovers, I present to you the Dry Ba Kut Teh Pork ribs. Here comes the highlight of the day! P/s : I'm not able to advice on the crab pricing as they follow the market rate & weigh by kilograms. The crab laksa is a new addition to their crab menu. 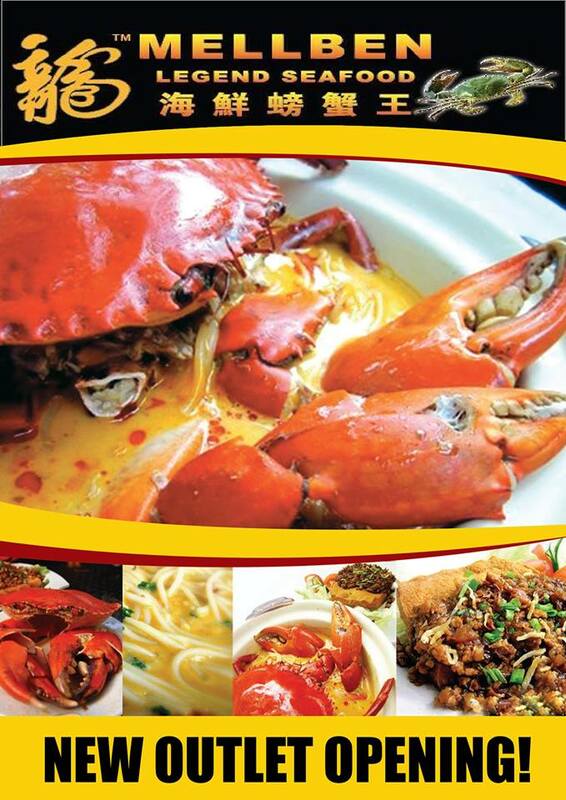 Famous for their Crab Beehoon, Mellben introduces the crab laksa to appeal to Singaporeans and curious tourists. Creative combination of the crab and local laksa, this dish allows patrons to enjoy the freshness of the crab and yet a local favourite at the same time. Yet, the thick gravy does not over power the sweetness of the crab. Not the usual kind of black pepper crab you would have. Not just black pepper, the chef also adds in the curry powder to level up the fragrant of the crab. A combination of curry and black pepper crab! Yums !!! In short, this is Liu sha bao (custard buns) in crab format. If I'm going to dine there again, I would order the lemon prawns again.Thinking about it is making me hungry!! My favourite crab dish is of course the Golden Sands Crab, while my least favorite is the Crab Laksa. (I'm not a fan of local laksa) The crabs served during the dinner were big, fresh and meaty(? ).Glad that all the crabs we had during the dinner had tons of flesh(crab meat) This is a nice place for family dinners as they offers a great variety of food choices, just like any zhi char stores. I would recommend this place for tourists who are looking for local flavors at a reasonable price. A pity that the location does not have any pretty sea view but definitely a comfortable place to dine in. Don't expect aircon and fantastic service as it is a very Singaporean kind of place. I also like the fact that the drinks menu have many choices of home made drinks, not to mention about my love for the coconut they serve ! Will re-visit to satisfy my crab cravings and bring my foreign guests there. Advice to make advance reservations before heading down. Psst... FLASH THIS TO THEIR STAFF AND BE ENTITLED FOR 10% OFF TOTAL BILL ! Visit their FB (here) for more updates ! Ending off with a group picture together with my crab-mates! Hope you are hungry now and enjoyed what I had for you ! Like so shiok only! I want to try the sand whatever liu sa crab! HAHAHAH!